We lived in Waterville, Maine for almost 10 years. (Okay, so it was really across the river in Winslow, but Waterville is bigger and is on most maps.) We like to hike and explore nature and we found lots of that to do. We don't like hiking in crowds -- how can you see and hear birds and animals when the woods are teeming with people? That's why Arcadia National Park and some other well know Maine spots aren't here. Campabello Island is really in New Brunswick, Canada, across the water from Lubec. Quoddy Head Lighthouse and state park is the eastern most point in the United States and is near Lubec. If you're going to one, you really should stop at the other! Campabello was the summer home of FDR and his home and it's grounds are now open to the public. Overlooking Friar's Bay, it is beautiful! Roosevelt International Park is open Daily, mid-May through mid-October. The beach is our favorite. When the tide is down, you can walk out to an island offshore. At low tides, there are some tidal pools and the water in them heats up nicely. The fort is up the road from the beach and has limited parking. Fort Baldwin is on a hill overlooking the old fort that has encampments from W.W.I. It's fun to explore both for a couple of hours. 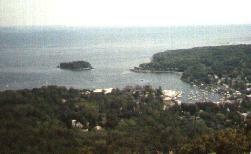 View of Camden harbor from atop the tower at Mt. Battie. The highest point in Maine, Mt. Katahdin, is here. It's the northern end of the Appalachian Trail. There are many hiking trail and camping areas. Everybody knows Freeport -- home of LL Bean and great outlet shopping. It's also home of Delorme Mapping -- we think they publish the best maps and atlases -- paper or electronic! Map N Go & Street Atlas are my favorite computer mapping programs & we don't go anywhere without an "Atlas and Gazetteer" for the state we are visiting. This isn't a very nice park for swimming in the bay, but is great for exploring with kids. It's very educational to explore and kids have a great time finding different shells and sea life. There are nice picnic areas if you just want to picnic by the sea and feel the cool ocean breezes. This is the setting for the movie "On Golden Pond"